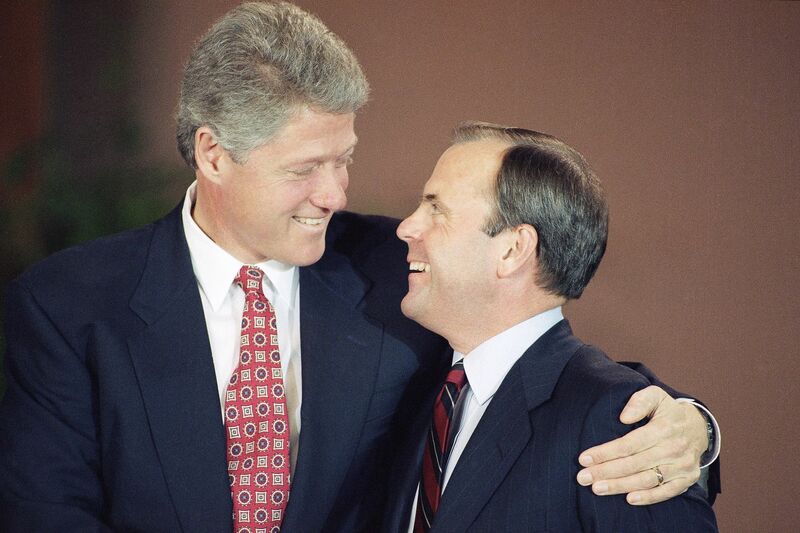 President-elect Bill Clinton hugs Chief of Staff-designee Thomas “Mack” McLarty at a news conference in Little Rock, Ark. on Dec. 12, 1992. McLarty has advised several presidents on trade: Jimmy Carter and George H.W. Bush (the initial force behind the North American Free Trade Agreement); and childhood friend President Bill Clinton (McLarty served as his White House chief of staff). Today, McLarty is chairman of McLarty Cos., a fourth-generation family-owned dealership business in Little Rock. He also is chairman and cofounder of advisory firm McLarty Associates in D.C.
"On balance, this was a reasonable approach to updating the NAFTA, which it needed to be updated," said McLarty. "It was 25 years old, there wasn't an internet when this was created, and like any agreement, it needed to be updated." While some analysts continue to study the 1,000-page trade deal called the United States-Mexico-Canada Agreement, McLarty has digested most of it. Here are some of his key thoughts. In a Free Press op-ed he cowrote last month, McLarty said that NAFTA was one of the first examples of a consistent and bipartisan consensus on trade policy. For example, the new deal calls for 70-to-75 percent of a car's content to originate in USMCA countries. Auto tariffs won't affect Canada and Mexico unless their exports to the United States top 2.6 million units a year. Analysts say Canada will be able to export $32.4 billion in parts while Mexico can export $108 billion in parts to the United States. Starting in 2020, the agreement requires that 30 percent of vehicle production must be done by workers earning an average production wage of at least $16 an hour. That's about three times the pay of the average Mexican autoworker, and in 2023, the production percentage rises to 40 percent. And while previously announced steel and aluminum tariffs remain in place for now, the agreement would stop the imposition of the 25-percent tariffs President Trump had threatened on imported vehicles from Canada and Mexico. "Certainty is so important in business, in terms of investment, and the fact that it's concluded is so important for all three countries," McLarty said. "There has been harm done to our relationship with Canada and Mexico," said McLarty. "This was a solution in search of a problem." All considered, McLarty said the glass is half-full, given that the USMCA "didn't break the glass. Had no agreement been reached at all, there would have been big disruption in trade and that would have been a setback."